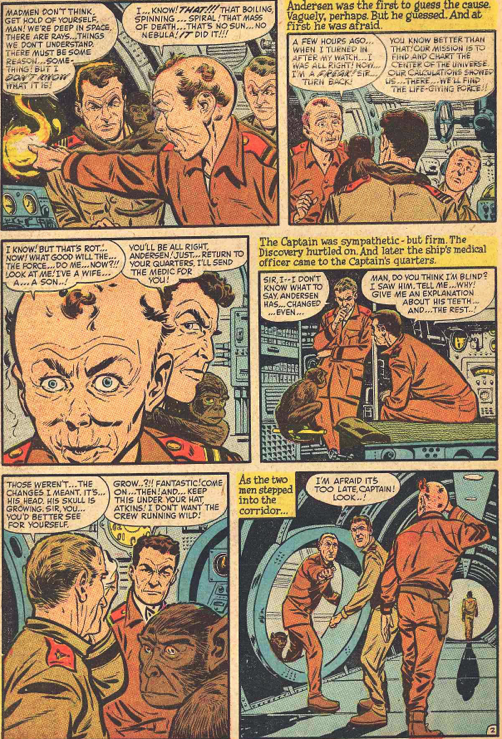 Peter: Wladek Zenko is sent from the Soviet Union to act as a "minor official to the U.N." His commissar reminds him that Americans expect Russians to act a certain way and he must uphold that reputation. Accordingly, he is rude and off-putting to the American family he must board with, that of the eminent newspaper man, Jacob Justis. Jacob's wife takes an immediate dislike to Wladek when the Russian is rude to her children, but Jacob reminds Emmy that Zenko's government is liable to have given the man orders to alienate any American he comes in contact with. Deep inside Zenko admires this family and hates himself for the way he must act, but a job is a job. After a few more incidents, Emmy confronts her boarder and tells him he must leave but, in a freak accident, the woman falls from an upper floor and is killed. Losing most of his sanity after watching his wife die, Jacob Justis vows revenge. The next day, Justis' paper prints an article claiming that Zenko will fully cooperate with the United States to bring the USSR down. When he tries to flee his apartment, Zenko is gunned down in the street. 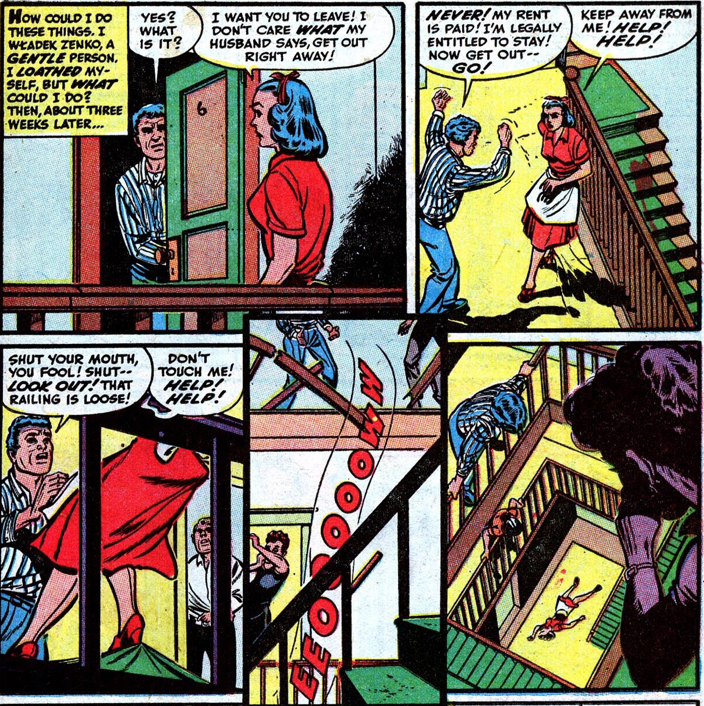 Red-baiting was far from rare in 1950s funny books (heck, Marvel made a killing thanks to communism and their big three of Namor, Captain America, and the Torch) but Harvey horror isn't known for its propaganda (or for messages in general, when it comes right down to it). 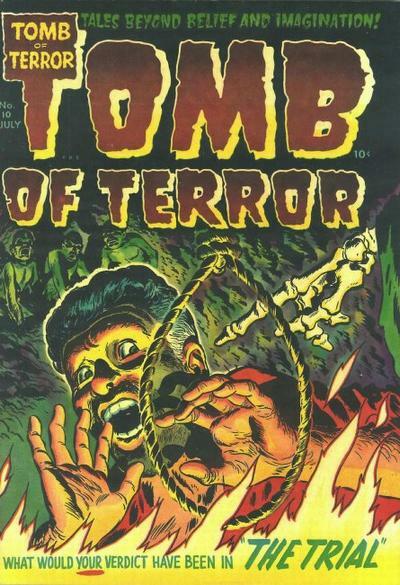 So, what led to the publishing of "The Communist" (from Tomb of Terror #11)? Perhaps, knowing what was coming down the pike in terms of censorship of violent funny books, the editors at Harvey thought they'd show our government they could provide a service by educating their pre-teen audience to the horrors of communism. Certainly, the reds in this story don't come off very well; in fact, they appear cold and inhuman. Put to the side the obvious message though and you've still got great storytelling. Jacob Justis (oh, the irony there) is a good man pushed to the brink of insanity by the perceived murder of his wife by a man he'd trumpeted. To dig a little deeper than the panels allow, Jacob probably feels guilt for foisting this stranger on his family and he's payed the price for being too trusting. In that moment after Emmy's death, Jacob becomes an animal. To add to the irony heap, Zenko is actually a good man; his enmity a mask he must wear to avoid, ostensibly, learning how to ice fish in Siberia. 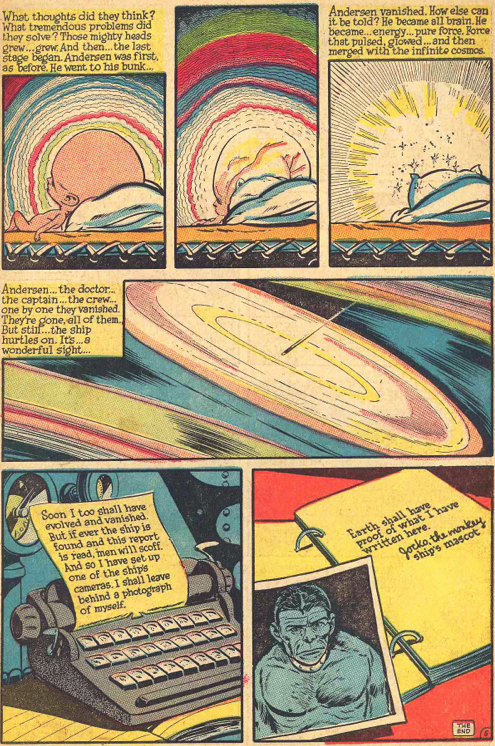 The climactic panels show that we Americans could be just as inhuman as the Russkies, as Justis signs Zenko's death certificate with his typewriter keys. Jose: Vicious criminal Luther Dark is lamenting his sorry state as a hoe-waving prisoner when he realizes the earth he’s tilling in the jailyard is especially soft. Perfect for tunneling out escape routes! 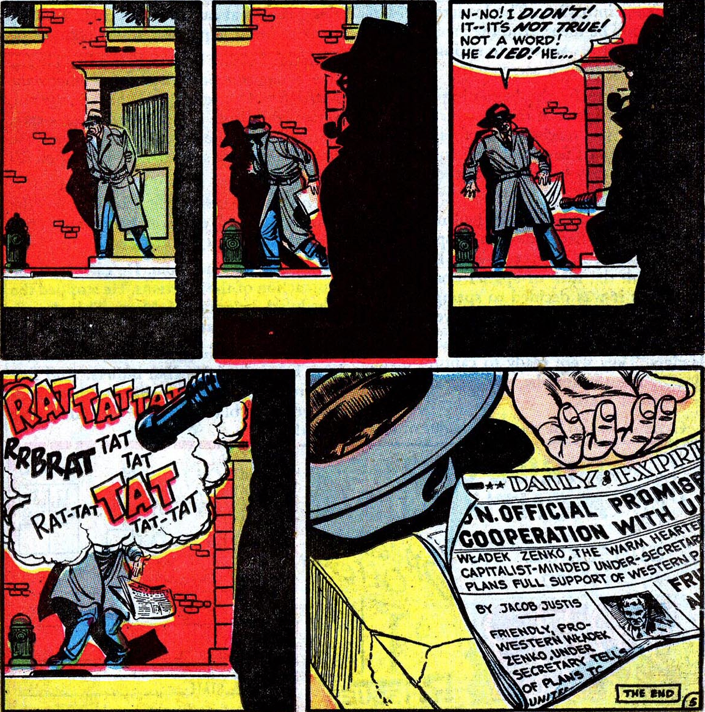 Dark smuggles a trowel into his cell and gradually chips away one of the cement block to begin his burrowing. Satisfied with his work for the night, he returns to the surface, oblivious to a fellow inmate who spies his progress. 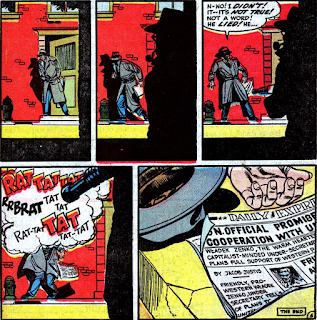 The creep tries getting himself a ticket out of the joint by threatening Dark with blackmail. He gets a twisted neck for his troubles. Dark makes more progress that night, puzzled by the large pools of water he runs into, and scrambles back to his cell just before the warden comes in for a routine check. Fearing discovery, Dark dives right back in after the guards leave. 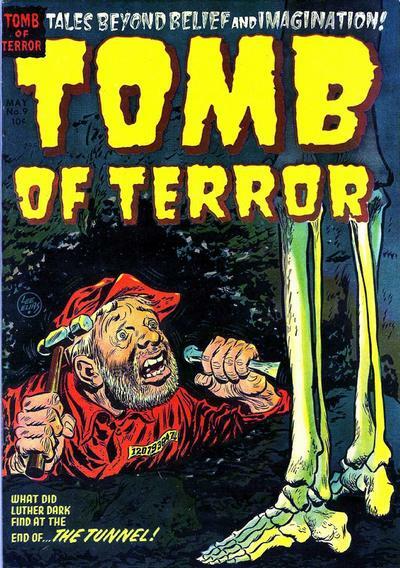 A broken trowel and even a smattering of human skulls do nothing to deter the criminal, who comes to find that the tunnel leads right to his eternal damnation in Hell. Just as sparse visually as it is narratively, “The Tunnel” (from #9) is a satisfying right jab delivered by pulp pugilist Bob Powell. The story is one of the few that utilizes a twist ending without compromising the remainder of the tale. Dark’s escape stands on its own legs strongly enough, with stings of suspense—especially the brief, nail-biting bit where the warden walks right over the chiseled slab, a moment worthy of Hitchcock—that bring another level of enjoyment to the story. Powell builds up the mystery until the infernal reveal, and it feels both apiece of the story and like the wild, grim joke it is. 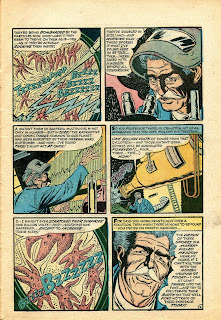 Peter: Two scientists, Jim and Carl, have discovered the secret of "Evolution" (from #12), unlocking the mysteries of immortality and superhuman strength. 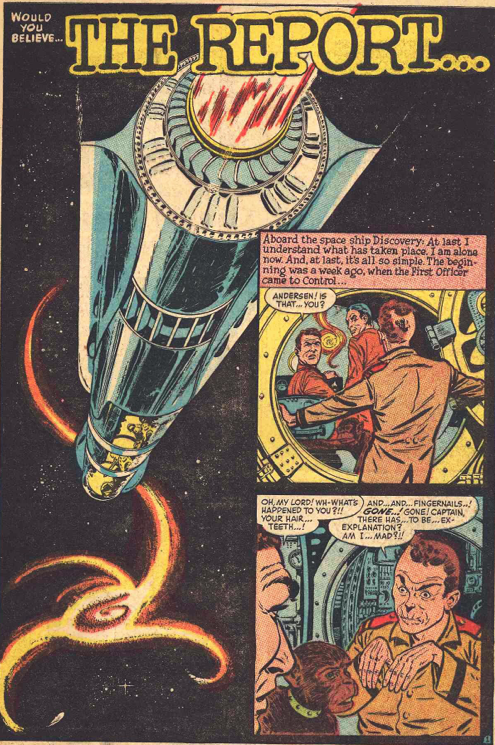 Jim wants to announce the breakthrough to the world immediately but Carl has more selfish designs on the new discovery: he wants to travel through time and become a superman. He bashes Jim over the head and jumps into the travel chamber, emerging a short time later as a superior being. 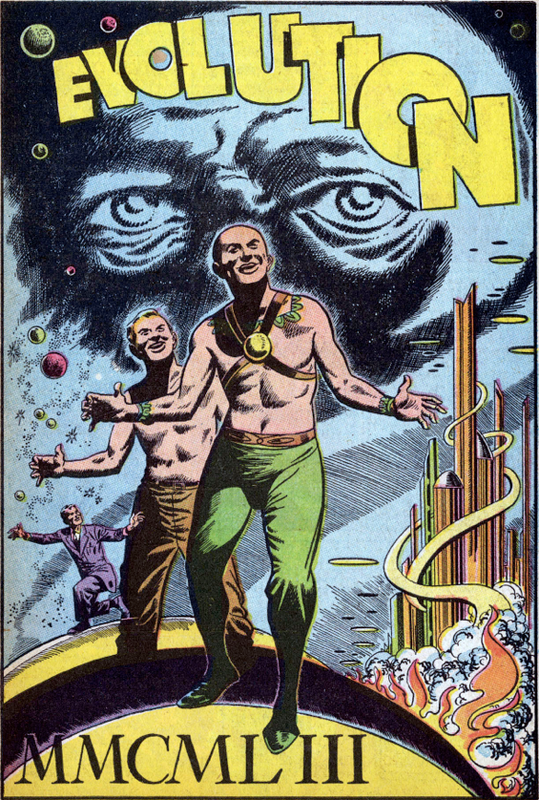 Jim tries to reason with his former partner but the power has gone to Carl's head and he decides to find out what awaits man even further in his evolution. 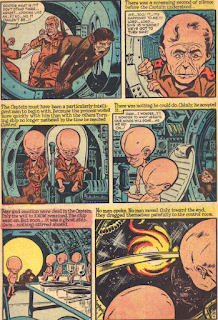 Again, Carl steps from the machine as a new being, this time one with mental telepathy and capable of accomplishing almost supernatural feats. The newfound superiority is short-lived when the Carl-thing announces he will push even further and enters the chamber for one final time. But something goes wrong and the machine sends Carl light years into the future, leaving nothing but a "mass of slimy protoplasm." I love these speculative bits of funny book fiction, especially time traveling stories. This one predates, by over a decade, "The Sixth Finger, "a very popular episode of The Outer Limits that features a very similar story line. In that story, David McCallum becomes the guinea pig of scientist Edward Mulhare, who sends the younger man on a trip through evolution that ends rather nastily. Here, the conclusion is every bit as grim. As is the case with most of these morality plays, greed turns even the best of intentions into evil. Jim excitedly (and, we come to find, naively) raves, "Think of it! 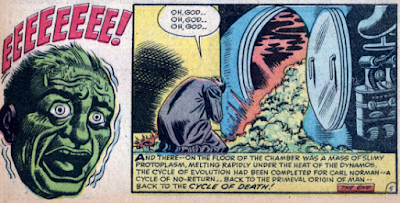 A person can step into this chamber, let the play of cosmic rays from this beaker play on his body -- and step out -- a superman -- a man evolved one hundred thousand years into the future! This is for the world, Carl!" only to be rebuffed with Carl's "Sorry, Jim! But your rosy picture of the world didn't fit into my plans!" 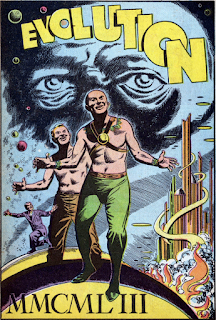 As a bonus, Manny Stallman's art is fabulous, sophisticated at times (as in the almost Virgil Finlay-esque panel reproduced above) and delightfully cartoony when it's called for (as when we see each new incarnation of Carl). 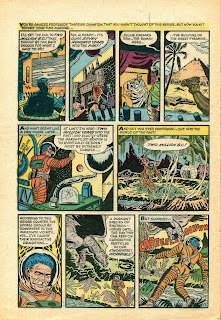 Unlike EC, Harvey didn't have any pre-code science fiction titles so we didn't get that many sf stories (other than the obligatory "lost race" morsel now and then). That may have worked in our favor since the bulk of the those stories that did show up are pretty darn good. Jose: Our tale starts by informing us that stern Aunt Harriet is not a “wicked” person, but she does have a tendency to throw her waifish niece Lucy into a dark closet—a space which the girl is terrified of—anytime the troublemaker tries eating food in the house that isn’t hers. During her last bout in the prison, Lucy promises her aunt that there’ll be no more unapproved snack time. But the pangs of hunger are stronger than promises, and Lucy is tossed back into the hoosegow post-haste. Delirious from her starvation and phobias, Lucy pleads to the invisible world for aid. Harriet overhears her neighbors speaking of her ill treatment of Lucy and resolves to give the girl a break lest she incur trouble from the law. But Lucy has made a friend in the dark, Gloriosa, who provides an unseen banquet for her guest. Harriet starts sweating when Lucy makes no move to leave the closet and goes in herself to prove Lucy’s fantasies as a delusion. Too bad Lucy locks her in the closet, forcing Harriet into a Catch-22. When a social worker arrives days later, he finds a perfectly healthy child… and a crazy aunt who insists on staying in the closet. “The Closet” (from #11) bears the same harsh bite as another story of kinder-cruelty, “A Rose is a Rose” from the previous issue. “The Closet” is the more insidious and haunting of the two because it restrains itself from any overt, gory payback and instead plays upon the nightmare logic of childhood to convey its horrors. While the orphan from “A Rose…” is introduced right off the bat as having a strange predilection for flowers (he claims to hear their voices), Lucy’s descent into desperation is efficiently illustrated for us and becomes the more believable of the two characterizations. The art, sadly uncredited, is quite a different look from what we’ve seen before, almost like a more domesticated Rudy Palais at times. The scenes of Lucy’s and Harriet’s breaking points in the closet are done with sympathetic urgency, and while “The Closet” may appear to be just another kiddie revenge tale it’s this surprising bit of humanity that separates it from the pack. Peter: Lab assistant Joe has always resented the fact that his boss, the brainy Professor Wilson treats him like dirt despite the fact that (in Joe's mind, at least) the men are equals. 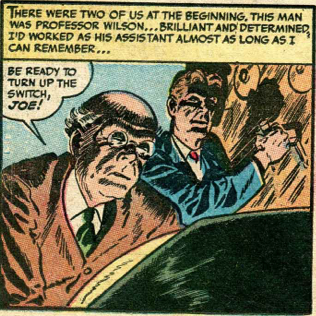 Joe knows just about everything the professor has ever worked on... except for one big project he won't talk about, an experiment so huge that Wilson considers it his crowning achievement. One day, the Professor's daughter, Jane, arrives for a visit and Joe falls madly in love with her at first sight. Wilson reminds Joe that he's just a lab assistant and nothing more, surely not important enough to date the boss' daughter. This infuriates Joe and he confronts Jane, declaring his love for her and begging her to feel likewise. Unfortunately, there's another man in Jane's life and, when confronted by the sight of his true love in the arms of another, Joe snaps and kills the man. 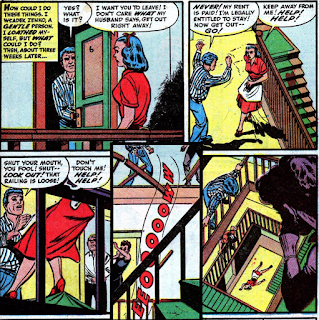 Terrified, Jane runs into the house and grabs a gun while Joe informs her that if her can't have her, no one can. The girl shoots Joe three times but to no avail; he strangles her and runs off to confront the Professor. 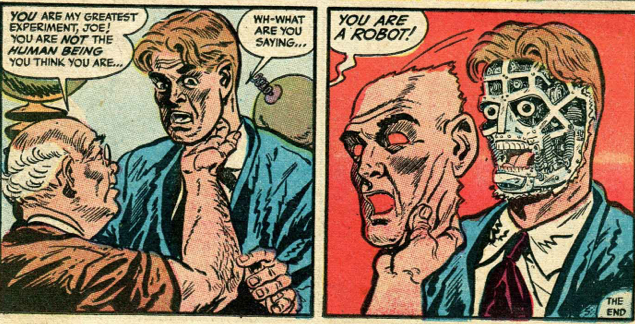 Wilson refuses to explain Joe's seeming invulnerability until Joe's hands are around the Professor's throat. 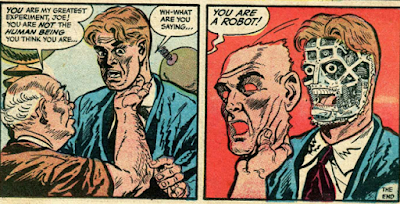 Seeing no way out, Wilson detaches Joe's face plate to reveal that his assistant is a robot; his greatest achievement. Most of the recommendation here is for the gorgeous Jack Starling art but, first and foremost, I've always put story ahead of illustration. 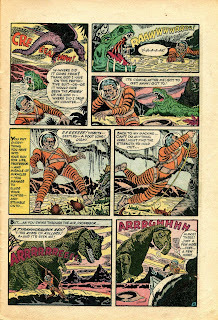 Ironic that, just above while discussing "Evolution," I bemoan the fact that Harvey strayed too seldom into the science fiction waters and, yet, here's another standout in that genre. Half way through the story I had the twist figured out... well, I thought I did. I was convinced that Jane was the great achievement, that her weird behavior was based on the fact that she was a metal doll. Her cold, unemotional response to Joe's plea for love ("Why... I don't know, Joe. I guess I might. Anything's possible...") seems to back up my argument and yet, just one page later, it becomes obvious I was fooled. 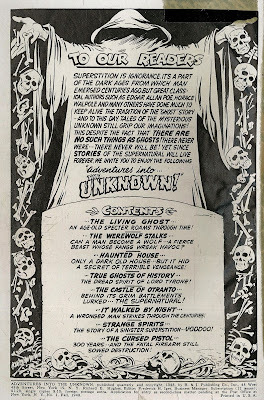 There's a lot of detail packed into this tight 5-page package but what I want to know is what happens on page 6? Wilson will soon discover that Joe has some gears that needed oiling and the consequence of not telling his assistant about his true ancestry is now lying in a crumpled heap in the living room. What will the Professor do and does he have a way of shutting Joe down? 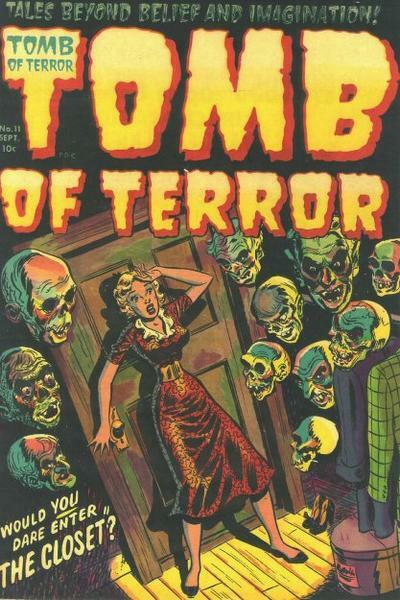 Artist Jack Sparling would go on to do some really bad stuff for the DC mystery line and forgettable fill-ins here and there at Marvel (his stint on Captain America in Tales of Suspense #87 is the absolute nadir of that series), but in the 1950s, the guy had a lot of talent. "What D'You Know, Joe?" (from #13) is proof of that. Another of the Shock SuspenStories-type tales to appear in the pages of Harvey, “Gambling Fever” (from #12) is a story that appeals to one of my favorite narrative tropes, the downward spiral. The more mishandled of these—think of those laughably cardboard morality films that spanned the 30s and 50s—attempt to set up their tragic heroes as bright and shining do-gooders with nary a blot upon their souls before becoming ensnared by the Big Bad Forces of Evil. “Gambling Fever” does right by presenting Larry as just a regular guy who takes a small leap outside his comfort zone, unwittingly placing himself in the fast track to hell through his own inner inhibitions and foibles. Larry isn’t harassed by loan sharks or hustled by mobsters; every bad thing that happens to him is of his own doing. 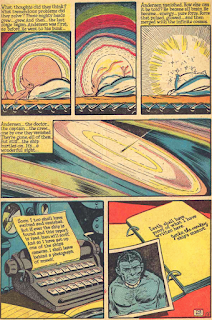 The final panel is such a bleak cosmic joke that it makes the laughter catch in your throat. Peter: Cooped up in a rocket ship to Mars for ten solid weeks, Stan and Dave are starting to get on each other's nerves and it doesn't get much better when they land and find nothing but red rock and dirt. Despite the depression, the two men are tasked to scout and survey a large area of the planet so they load up their all-terrain and head out to see what's what. Nothing but miles and miles of nothingness seems to sink Dave into a mental mire and Stan quickly becomes concerned for his own safety. 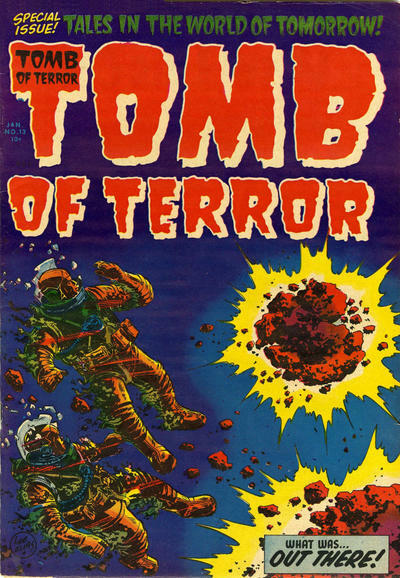 While inspecting the outside of the ship, Dave attacks Stan with a knife and the latter is forced to shoot his partner and bury him in the Martian soil. 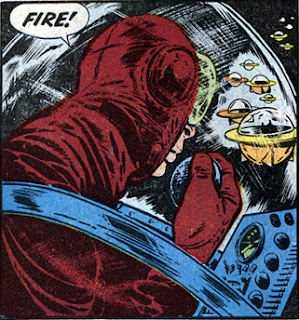 After completing his mission, Stan packs up his rocket ship and heads home, cursing Mars for being a barren, lifeless hell. 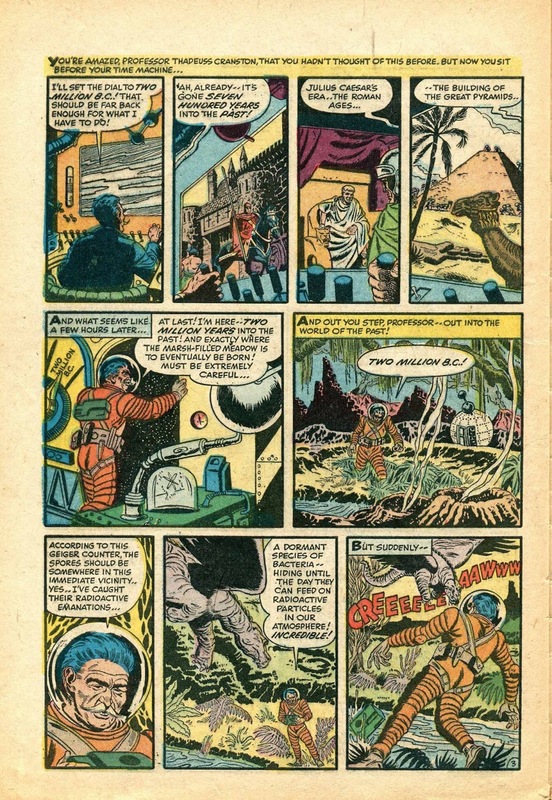 As he boards the ship, he doesn't realize he has stomped out the miniature Martian civilization with every step of his boot. Behind what appears to be one of the goriest covers in all of funny book horror history (but, upon closer inspection, reveals otherwise) lies yet another great science fiction tale (I'm seeing a pattern that may just continue), one of madness and isolation. 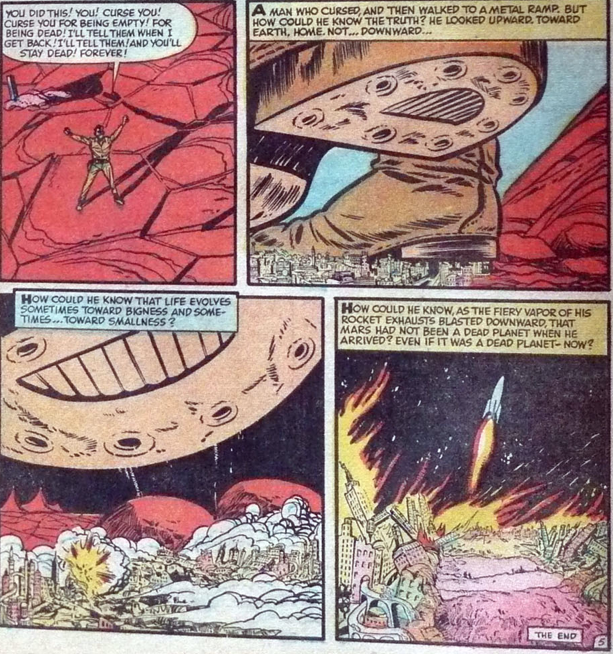 Obviously, some reality shortcuts were taken (the guys aren't wearing protective gear or space helmets) with "The Dead Planet" (from #15) but this was back in a time when we thought the world was flat, right? The very nature of the exploration is particularly vague; we never know what is to be accomplished by the scouting. And why is Dave so cocksure there's a Martian race waiting for them, arms open wide ("There will be people! There'll be women... kids...lights! There must be!")? 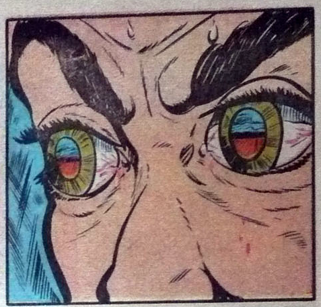 The mystery and ambiguity of the trip actually adds to the dread we feel when we witness Dave begin to unravel (in a brilliant image, the red nothingness is reflected in the astronaut's unblinking eyes). This could very well be us losing our marbles. 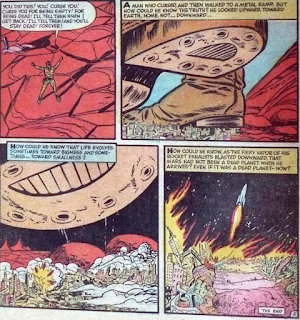 The final chill sent down our collective spine is that fade-out, where Stan unknowingly wipes out the entire Martian race under his wanderin' boot heels. 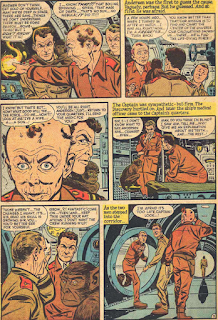 If Wally Wood and Basil Wolverton had created a love child (no snickering -- just follow me on this), it would certainly have been the uncanny Bob Powell. The aforementioned "Dave's eyes" panel and the sequence where Stan contemplates the killing of his partner while in a zen position capture the desolation of a place fifty-five million miles away from the nearest bar. 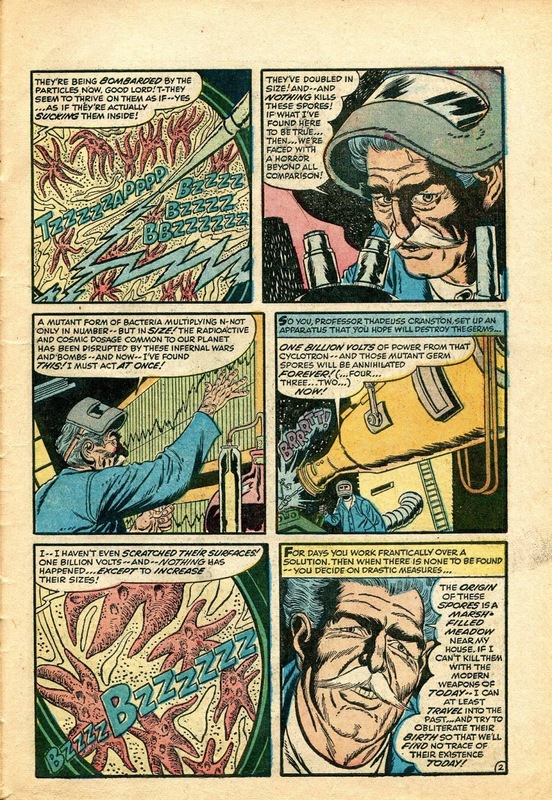 Jose: Adams, hotshot reporter, attempts to interview Dr. Vance Radfield in his final moments before the scientist takes the long walk to the execution booth. Radfield is delirious with terror and insists that the inkslinger believe his fantastic story... Working in conjunction with elderly and learned John Dean, Radfield watches in apprehensive wonder as Dean bombards a beaker of isolated disease cells with cosmic and UV radiation. When the slime throbs and grows under the rays, Radfield warns Dean to cease the experiment. Not soon enough, as the lab explodes right in their faces. When Radfield tries calling for help, he’s alarmed to see his senior partner is in the middle of being consumed by the now enormous puddle of protoplasm hungry for the flesh of humans! Radfield attempts to rend it apart, but this only produces another puddle, ever dividing into more threats like the Hydra of myth. Radfield realizes that he cannot let a speck of the goo out of the cratered lab. Taking an acetylene torch, Radfield goes to town on the writhing blob. Satisfied, Radfield leaves and is promptly accused and sentenced as Dean’s murderer. But word has been going around of blob sightings in the country. Radfield pleads with Adams to share his story and stop the blob invasion at all costs. Leaving the prison, Adam dissembles into the masquerading goo he really is and plots the destruction of the earth. Sometimes you just need a good shot of that purple prose liquor to get you fired up. “Death Sentence” (from #14) is a romp of mad science and monster mashing that shirks all pretenses of complexity and sophistication to deliver the freaky fun. The script is laced with the kind of boisterous, full-blooded descriptive language that marks it solidly in the pulp tradition: “I stood there paralyzed… watching the quivering, jelly-like mountain of red-gashed flesh grow… and evolve… grow and evolve… transforming form and life… into shapeless entity…!” And need I elaborate on the inherent badassery of an acetylene torch battle with a blob monster? Some might consider the ending silly, but it’s in fact such a juvenile twist that one can’t help but be surprised and more than a little charmed that the writer actually went through with it and made it work. 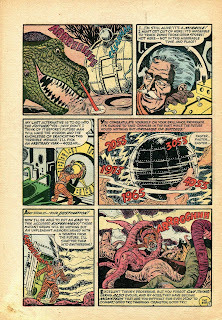 The rarely-seen art of Sid Check complements the frenetic energy and whackiness of “Death Sentence” perfectly. Jose: Bull Akers is a beast in the urban jungle of the city who has just throttled a frail old woman to death to get to the register in her shop. Akers comes away with only nine crummy dollars and has the alarm raised by a pair of pedestrians. Fleeing into the frozen streets, Akers is shot by a pursuing officer. The killer barely manages to elude the cop and trudges through the snow with a fatally bleeding wound. He almost collapses in the doorway of an eminent physician whose surgical aid he seeks to save his life. Dr. Hardwood is wary of performing the surgery at first, but the radio bulletin detailing Akers’ crime incites him to carry through with it to the protestations of his assistant, Bakewell. The medicos have been working on a secret procedure that will ensure Akers will live to see another day. It’s a shame they didn’t explain that it would mean Akers having his brain vacated from his skull and living independently in its own cozy little tank. Try not to think too hard about the ending to “Going… Going… Gone!” (from #16) and you’ll probably be better for it. 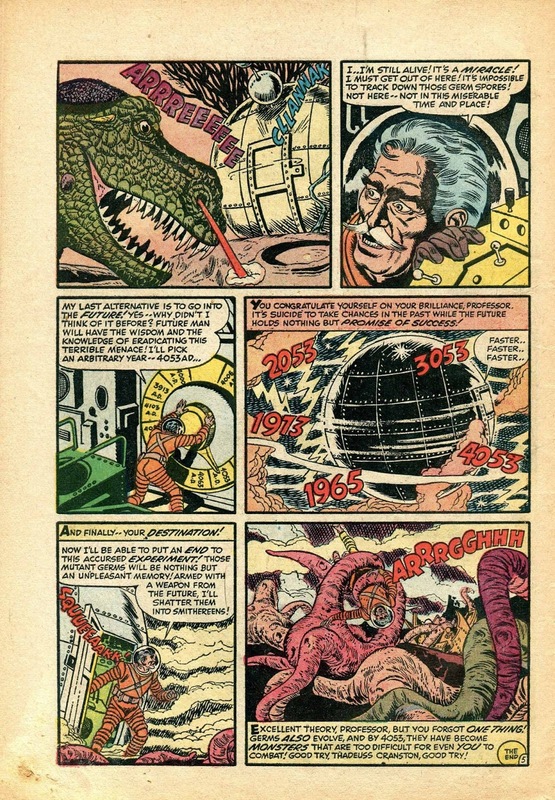 Though the climax makes less and less sense with further consideration (why does the final panel show the brain with its own pair of snail-esque eyes when Akers still has his own in his head? ), the preceding story has a very nice, noirish beat to it that promises a better turnout than what we end up getting but is no less enjoyable for that. The real showcase here is the controlled, rhythmic narration in the early goings (“The screams are caught up in the city’s noises. The concrete jungle roars its iron symphony of sound. 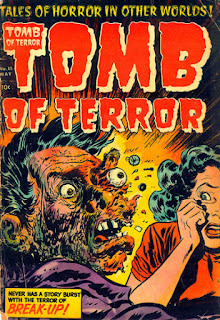 But terror is a discord even here…”) and the attractive art of Joe Certa. What’s even better is that, in a rare display, the story reins back on the captions to allow Certa's moody, wordless panels to speak for themselves. That makes this one a highlight in of itself. "Too late! Too late for anything! Too late for prevention! For life and its force! Too late for the alien masters of the universe! For they were conquered by something smaller than the molecule... tinier than the atom... something unseen even in the sight of the mightiest microscope. 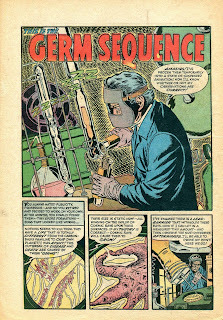 How degraded the aliens would feel if they knew they were defeated by the -- common-cold germ!" I'll head you off at the pass by letting you know that, no, this isn't billed as H.G. Wells' End Result nor is there any nod to the master at all. Bob Powell, artist and writer (at least according to the GCD), must have woken up late that day and realized he had a deadline to meet (Bob's really nice art is, unfortunately, negated by his plagiarism). We know Bradbury would sue (or at least demand credit) but Wells was a decade in the grave, an easy target. Ballsy though, since the George Pal movie version of War of the Worlds had been released just a year before. How many little kids finished "End Result" (from #14) and scratched their heads, trying to recollect where they'd come across that finale before? 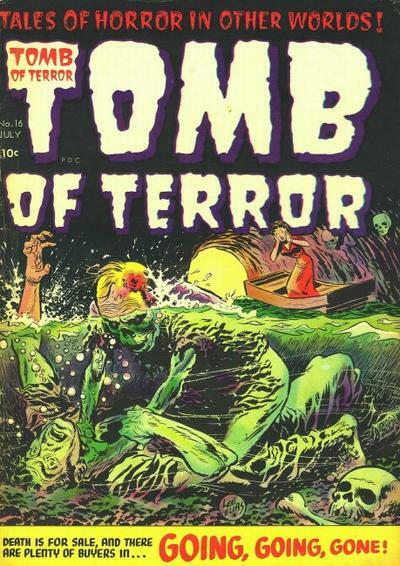 So, usually I award the coveted "Stinking Zombie" to the most boring or insipid script of the month but this time out I'll make an exception and give it to the most blatant rip-off. Apparently this is what angry people look like. 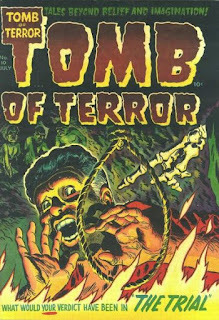 Jose: A boy with a metal face is left stranded by his parents who take a fast rocket to Splitsville, leaving little John weeping by himself and getting his face rusty. In walks creepy older man Good Samaritan Bill Sauter who decides to take the lad into his home and raise him as his own (like you do). Their days are preoccupied with games and walks in the woods, but Johnny yearns to play with the regular boys. The other kids accept him into their ranks well enough until their parents arrive and put an end to stickball. When Johnny returns the next day, the kids call him names and pelt him with rocks, killing him. Bill flies into a rage at the adults whom he claims tainted their children’s minds with prejudice, having absolutely no evidence of this, and mourns for the boy at home where it is revealed that Bill’s whole back is a metal plate just like Johnny’s face. Pictured: the reader and the story's message. “The Outcast” (from #13) clearly strives for the type of “fantastic tale as morality play” vibe that served programs like The Twilight Zone (mostly) well, but utterly fails in the attempt on many levels. The sequential art is stuffed to bursting with repetitious captions that try posing as flowery and moving bits of narrative, constantly hitting the reader over the head with its messages of inner beauty, friendship, and acceptance. If it all weren’t drawn so thinly (Bill’s a Good Guy, Johnny’s a Good Kid, all the grown-ups are Bad Bigots) the story might have had a fighting chance. But the tin-eared delivery sinks whatever good intentions there might have been, leaving its final note mushy where there should’ve been bite. "God... what a break-- what a blinking good break!" "Look, Thorgenson... I'm a master mechanic. I could fix an M-2X atomic-turbo engine... or a jelly doughnut!" "Suddenly, the steady hum of the rocket's engines was splattered." Obviousness taken to new heights! "Power! More power!! My rivals will soon learn of it -- and they'll -- croak! - "The Harder They Fall"
"You've played enough, Sam! Louis... you're going to get it from your mother. You're filthy!" Jose: Like last month's selection, my pick this time around recalls a nostalgic literary tradition from my youth. 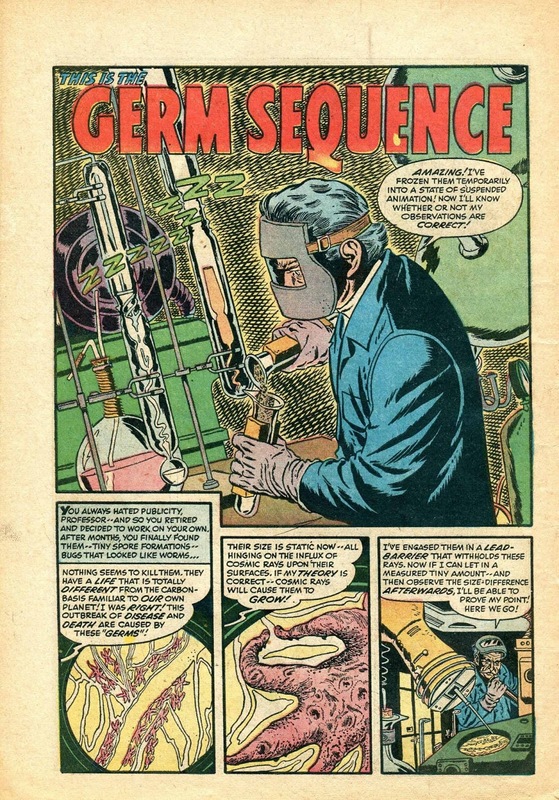 "Germ Sequence" (from #13) is an earnestly-told but oh-so-goofy account of a determined scientist's attempt to stop a batch of tentacled germ spores from growing big enough to conquer the world. 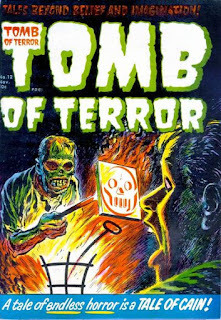 His misadventures with his time machine make me reminiscent of the Choose-Your-Own-Adventure books that were all the rage during the 80s and 90s. "You opt to bombard the germs with electricity--no, that doesn't work--but how about going back in time?" Our poor scientist meets the same type of ending that many frustrated children invariably came to twenty years ago when they found that the narrative course they had chosen was their last. 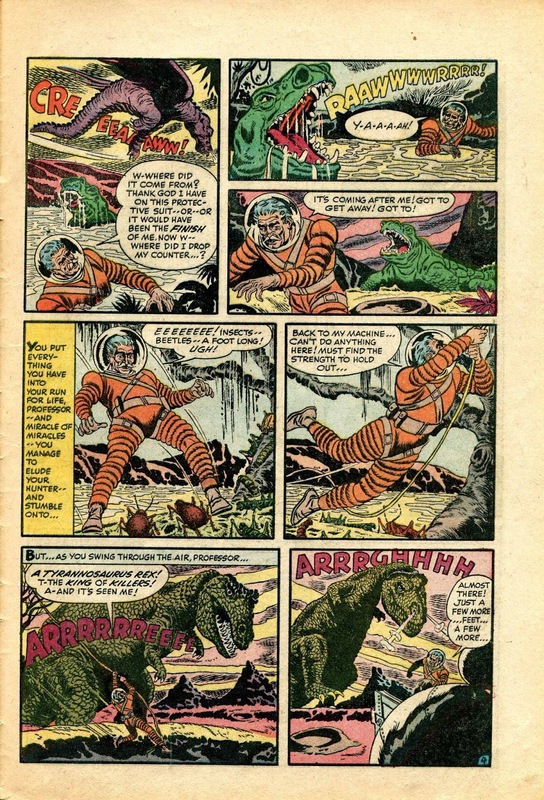 Read on, dear adventurer, and watch out for that laser-snorting T-Rex! For the past five months, we've read the entire output of Harvey Horror. 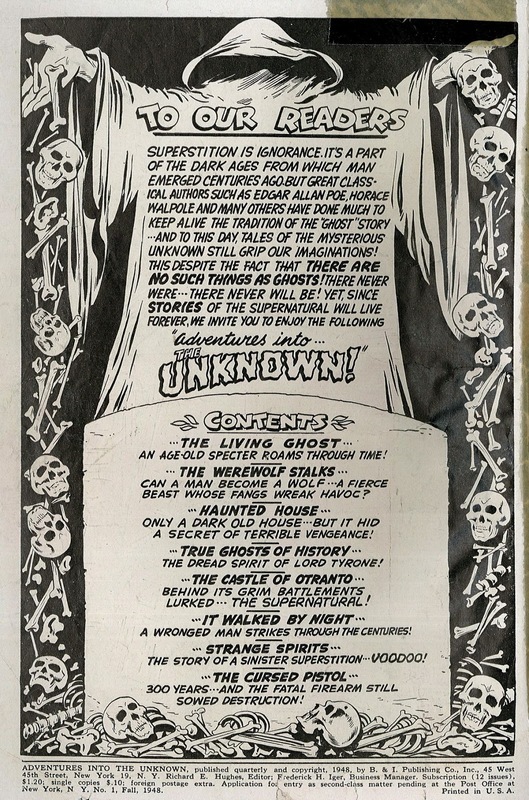 That's 4 titles, 88 issues, 350 stories. It's been a very interesting and enlightening journey but it's only the very first stop on that journey. 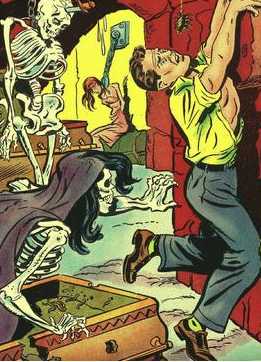 Next month we begin our 12-part dissection of the American Comics Group. But first, we'd like to cap off our Harvey coverage with a few lists. 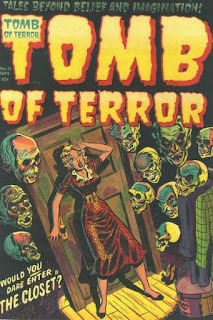 In four weeks, we take our first dive into the pre-code horrors of American Comics Group with Adventures into the Unknown! 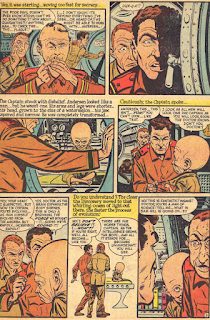 "Heck, Marvel made a killing thanks to communism and their big three of Namor, Captain America and the Torch." 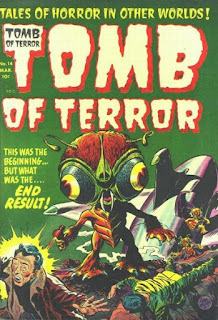 I don't really know those three (except the Bronze Age and late Silver Age ones), but I do know a whole lot of those Atlas-Marvel horror comics mainly due to those reprints in "Where Monsters Dwell" and so many other titles, and Communists are worked into those SF stories ad nauseam. Sometimes they're entertaining, but sometimes they can be really eye-rolling, even with that whole "product of their times" way of looking at them. What an excellent post. Very informative and interesting. I highly enjoyed reading it. Thank you. While I'm here I would also like to invite you to participate in my upcoming blogathon in August. The link is below with more details. "The Report" must have inspired a story in Weird War # 15 that I've always been fond of, called "The Survivor." Oddly enough, it's about the same thing happening to a Viking ship's crew, but the ending is identical. 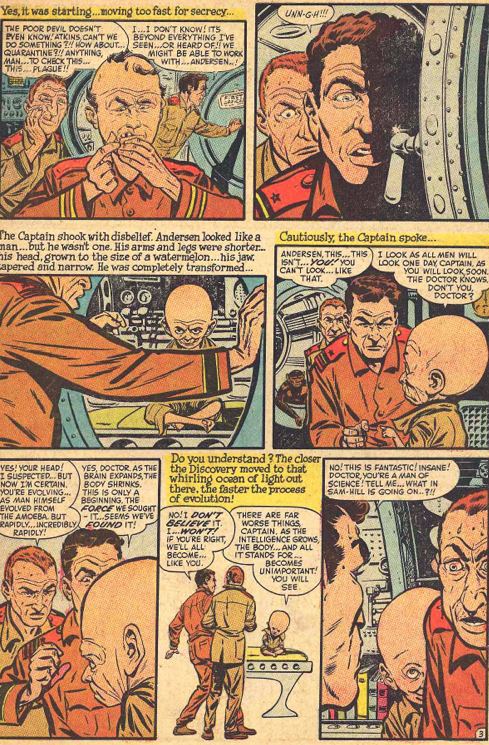 Thanks for the heads-up on the Weird War Tales story. Jack and I will be getting to that particular war issue on March 26, 2027 but I'm going to cheat and read it right now. Don't tell Jack!